Before the 20th Cntury, the Torajan was live in autonomous villages, where they practiced animism believe and was being untouched by outside world. At early 1900s, the Dutch missionaries worked to convert Torajan highlander to Christianity. Since then, Tana Toraja was officially opened to the outside world, formerly in 1970, and became an icon of tourism in Indonesia. Although most of The Torajan hold Christian or Moslem, most of the elder are still believe in traditional believe named Aluk, which mean “The Way”. The official name is Alu To Dolo or “Way of the Ancestors”. Aluk is a cultural or rule of life which brought by the immigrants from Indochina plateau at about 3000 years until 500 BC. There are two famous Aluk that The Torajan believe, they are, Aluk Sanda Saratu and Aluk Sanda Pitunna. The Torajan is strictly concern about their culture that being held inherits from their ancestors. Hence, there are two important ceremonies within The Torajan, they are: Rambu Solo ceremony or funeral ceremony and Rambu Tuka. 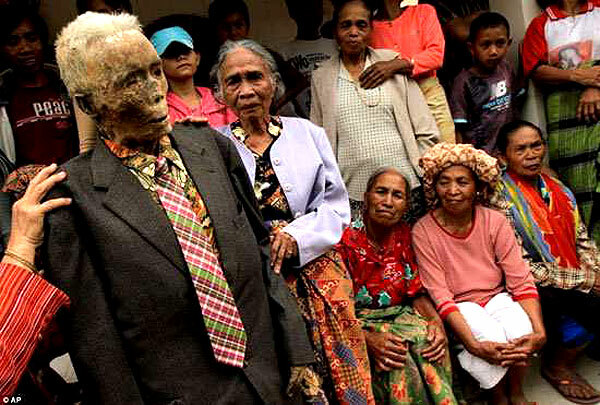 Rambu Solo Is a customary funeral, which requires the family that the deceased made a party as a sign of their last respects to the deceased who had left. Funeral for The Torajan people is the important ceremony relating to their social status or relating to the decease itself. When a person dies, the body is placed in the back room and it will leave there until the family gain enough money to give a decent an appropriate ceremony, so that the decease can go to the next world. During the time when the decease left in back room, it remains as sleeping and the family are still offer food and drink. The soul can only go on to the afterworld when the death ritual has been enacted. When the funeral ceremony has arrived, there is a procession around the villages so the departed can bid farewell to the living. Everyone gathers at the site for the celebrations, where bamboo pavilions have been erected. There is also a buffalo lying in the center of the pavilions, the existence of this buffalo is important part of the funeral ceremony. As the relatives believe that the souls of animals follow the master to the next life, this account for the requirement of animal sacrifices at the local requiems. A strong buffalo is needed to carry the soul of the master on the journey to the afterworld. Generally, instead of being the important part for the funeral ceremony, buffalo is also playing the important part in Toraja society. The buffalo is a symbol of wealth and power. The more important of one dead person, the more buffalo are being slaughtered. In an attempt to impress, the family will slaughter as many buffalo as possible, and quite often this can cause financial ruin. There are three methods of burial for the Torajan people. The coffin, plus any possessions which will be needed in the afterlife are placed either in a cave grave, a stone grave or a hanging grave. There are many caves in the surrounding limestone hills, and for most people the coffin is placed just inside the cave entrance. The wealthy often have a stone grave carved out of the rocky cliff. This cost a considerable amount as it takes a specialist many months to chisel out the tomb. A carved effigy of the deceased is made and placed on the wooden balcony built on the rock face. These statue or tau tau look down over the land, and offerings are put in their outstretched hands. Other Torajan burial method is a hanging grave. The coffin is hanged by the ropes in a cliff face. After some years the ropes inevitably rot and the coffin falls to the ground below. The babies and children coffin are hung from trees. The Torajan dwell about these three burial methods are because they do not want to waste their spaces land to be a cemetery. So, the land is just purposely to be a green field for rice and agriculture. Rambu Tuka, is a cermony associated with the ceremony of wedding ceremony, harvest time, inauguration of the traditional house or new tongkonan, or from being complete renovation. According to the myth that lives among the Torajan who believe in their traditional culture of Aluk Todolo trust, someone who had died, in the end, they will go to a place called puyo; which is the spirit world, a gathering place of all spirits. It is located in the southern part of human habitation. To get to the puyo, the spirit needs to be preceded burial ceremony according the social status during his life. If there are no rituals or ceremonies that take place, it will be imperfect in Aluk, the spirit cannot be reached Puyo, and the soul will be lost. In Torajan marriage, marriages used to be arranged, and only between members of the same caste. You were not allowed to marry someone from another caste. Families got richer this way, as the combined wealth of two rich families would make an even richer big family. Now, some marriages are still arranged, but it is more common for “love marriages” to take place. Although marriage between members of different castes is permitted, it is still not common, because of the economic factor. No-one wants a financial liability. After marriage, the man always goes and lives in the woman’s village, with her family. The houses are owned by the women of the family. More about the Torajan, it is said that everything is shared: food, clothes, money, possessions of all types. Once you are in the community, you are expected to share what you have. At the same time, people will share everything with you. Because of this, there is no such thing as privacy. Everyone knows everything about everybody. There are no shut doors, and no personal boundaries. The community, the family, the group, is more important than the individual. Whatever money one member of the family earns, she/he must share with the rest of the family. Children who make money share it with their family members. In daily speaking, the Torajan use their language named Sa’dan Toraja. Bahasa Indonesia is still become a national language but in daily speaking they use traditional dialects. In economic field, before “New Order” administration of second president of Soeharto, the Torajan economy was based on agriculture, with cultivated wet rice in terraced fields on mountain slopes, and supplemental cassava and maize crops. Much time and energy were devoted to raise water buffalo, pigs, and chickens, primarily for ceremonial sacrifices and consumption. Since 1965, when the new order had begun, the Torajan economic was become growth to the level of foreign investment. Multinational oil and mining companies were opened and the Torajan youngster was wander to other area to find the better life. The Torajan economy gradually shifted to tourism begin in 1984. Between 1984 and 1997, many Torajans obtained their incomes from tourism, working in hotels, as tour guides, or selling souvenirs. In conclusion, Toraja people have a very strong sense of identity and culture. No matter where they live, they will always consider themselves to be Toraja first. They are proud of their culture. The culture is the Torajan themselves.